Though it’s all around us, many people don’t know what is meant by the term Industrial Style in furnishings and interior design. Industrial Style refers to exposed building materials that are often concealed in construction, reminiscent of an open unfinished warehouse look in building design. For furnishings the style often implies vintage, but it can also be modern. It tends to offer plenty of raw, unfinished surfaces, accented by metal and characterized by visible (rather than hidden) mechanics joints, fasteners, bolts, grommets, screws, and the like. The look and feel of industrial style can be incorporated in many ways. In general, spaces tend toward open with minimalist styling, reduce clutter and let key pieces of furniture speak for themselves. Cool shades of blues and grays will invoke a warehouse feel, though if you are furnishing a vast open space, warm neutrals will soften a space that is comprised of cold walls, metal pipes and ductwork. Flooring should be simple and uncomplicated. If you have hardwood, tile or concrete flooring, leave them bare or stick with low profile woven rugs. This unique look has captured the hearts and minds of many. But you don’t have move into a loft, a warehouse or invest in a complete remodel to embrace the look in your home. Accents and details abound that can add an industrial flair to your space without breaking the bank. 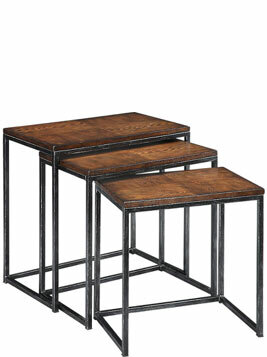 To add an industrial touch to your room, look for unfinished metal frames and details, for example: a vintage end table with obvious destressed finish is detailed with rustic hardware, a desk that mixes sleekly finished wood with metal supports and stablizers, nesting tables with unfinished wood metal frames and distressed wood tops. Industrial style embraces exposed construction elements such as beams and pipes, mixing wood and metal. 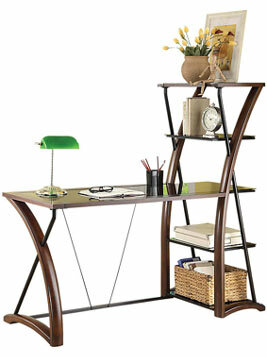 This media center mixes roughly finished wood with pewter details and exposed screw heads. 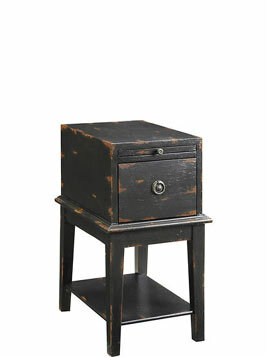 Add vintage inspired décor details to your space such as such as gears trunks or metal baskets. This dining room set incorporates structural metal tresses, nailheads and vintage wheels and hardware on the server. These retro stools and table create a casual dining space with a quirky unique flair. Exposed brick wall and cement floor are softened with an area rug and mechanically inspired wall art. This comfy living room is still warm and enveloping with just a touch of industrial sprinkled throughout for interest -- with industrial styled stool, lamp and table set.